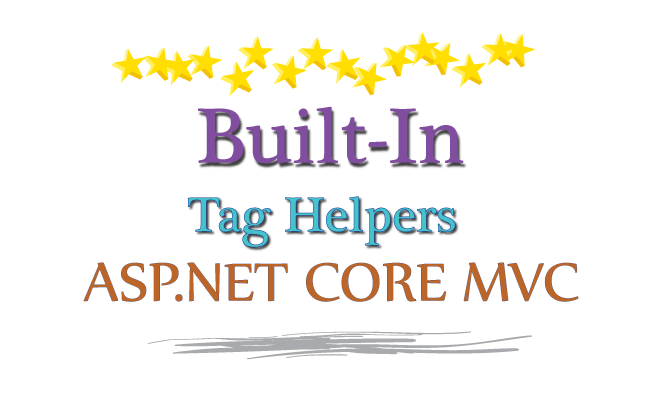 Built-In Tag Helpers are pre-built in the Core Framework and are used internally by the Razor. They perform common tasks like creating forms, showing validation messages, binding elements with Model, etc. In this section I am going to discuss about the Tag Helpers for Form, Input, Select, Label, Anchor, Text Area elements, CSS, JS and Cache. Form Tag Helpers help them to target the correct Action method based on the application’s routing configuration. asp-controller Used for specifying the controller to target based on routing system. If omitted then the controller of the current view is used. asp-action Used for specifying the Action method to target based on the routing system. If omitted then the action rendering the current view is used. asp-route-* Used for specifying the additional segment value for the URL. Eg asp-route-id is used to provide value for the ‘id’ segment. asp-area Used for specifying the name of the area to target. asp-antiforgery Generates a hidden Request Verification Token to prevent cross-site request forgery. It is used with the [ValidateAntiForgeryToken] attribute in the HTTP Post action method. In the View I created a Form element. Notice the use of asp-controller=”Home” and asp-action=”Create” Tag Helpers to create the action attribute of the form. The ‘Form’ has the method of type ‘post’ so that means when the form will be submitted then the ‘Create’ Action method of type HttpPost will be invoked. So go to the Home Controller and add the 2 Create actions, one for HttpGet and the Other for HttpPost. Remember to apply [HttpPost] attribute to the action of type Post. Actions without [HttpPost] attributes are of HttpGet type by default. I have applied the HTML for attribute on the label elements. It specifies the element with the label is bound to. The Input elements have been given names – ‘Name’, ‘Price’ & ‘Quantity’. These are the names of the properties of the Model Class ‘Product.cs’. 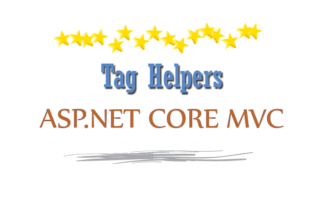 By giving them these names MVC will automatically bind the parameter of the HttpPost Create Action method (i.e. public IActionResult Create(City city)) with these values. 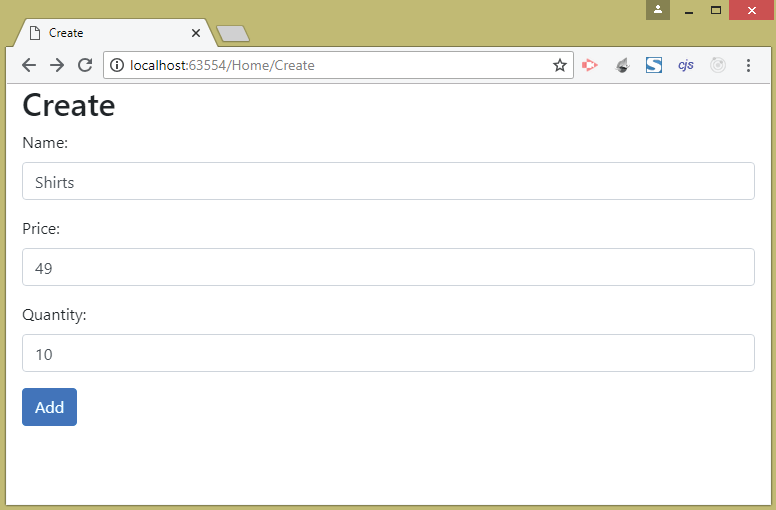 Now run your application and go to the URL – ‘/Home/Create’ where you will see the form. 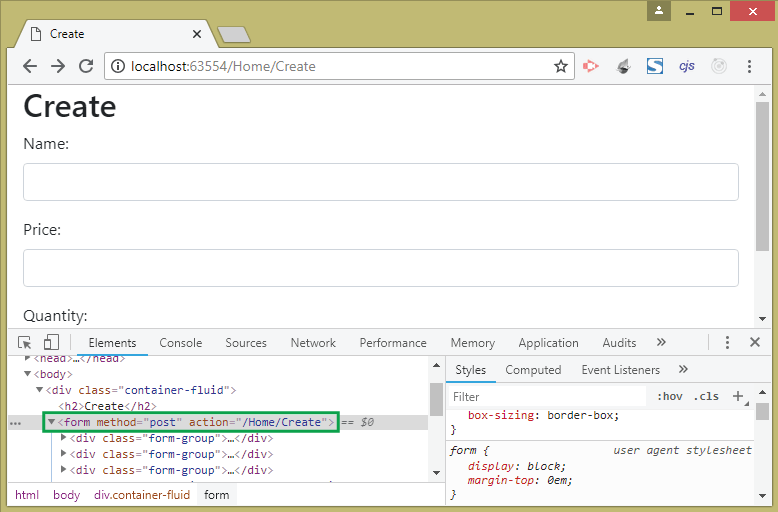 Inspect the Form element in your browser and you will see the action attribute created as /Home/Create. Next fill the create form and click the ‘Add’ button (see the below image). You will find a new product is added to the repository with values you gave in the form. You will be redirected to the Index View which will show your recently added product at the last in the product list. 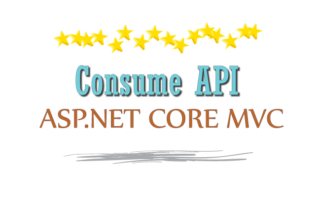 Note: Since the Create View form’s action attribute is invoking none other than itself only therefore there is no need to apply asp-action and asp-controller tag helpers. 1) Adds a security token in a hidden input element to the form. 2. Adds a cookie to the response. The application will process the request only if it contains both the cookie and the hidden value from the form, which the malicious site cannot access, and hence CSRF is prevented. To use this feature add the tag helper – asp-antiforgery=”true” to the form element and add the attribute [ValidateAntiForgeryToken] in the Action method. Now in the Developer Tools window, go to the ‘Application’ tab then click ‘Cookies’ on the left panel. You will see the anti-forgery cookie created by Core MVC and it will be sent to the controller along with the response (see below image). In the Controller’s action the applied attribute ([ValidateAntiForgeryToken]) will automatically validate this cookie and security token. 1. Sets the ‘for’ attribute of the label to the Model property name. 2. Sets the content of the labels to the Name of the Model Property. asp-for : This tag helper sets the name, Id, type and Value attributes of the Input element. 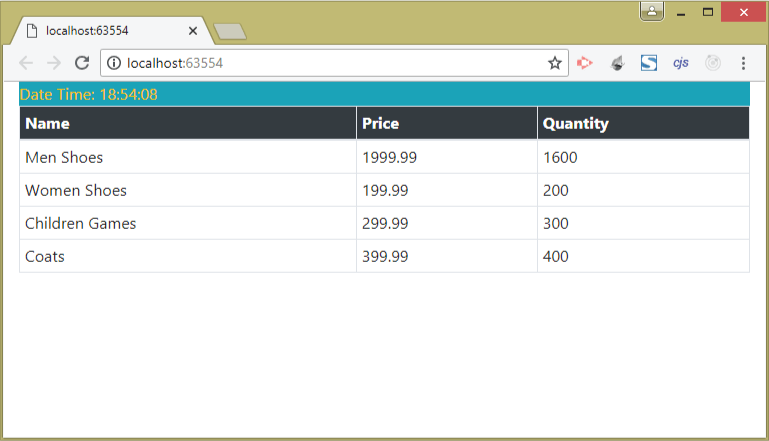 The Price and the Quantity Input element have additional attributes added to them. These are ‘data-val’, ‘data-val-number’, ‘data-val-required’. These are used for doing server side validation. I will teach you about them in the Model Validation Tutorial. So ignore them for the time being. You will find the Name and Price Input controls are of type ‘text’ but the Quantity Input control has the type ‘number’. The reason is because the Core MVC provides the ‘type’ to the Input controls based on the Model Property Types. Note: The asp-for Tag Helper when applied to a text area sets its id and name to that of the specified Model Property. asp-for Sets the id and name attribute of the Select Element to the Model Property name. asp-items Specifies the source of values for the option elements contained inside the Select Element. Now run your application and go to Create action URL (‘/Home/Create’). Give it name as ‘Pants’, Price as ‘88’ and Quantity as ‘150’. Now add it to the repository by clicking the add button. Now bind this last added product to the Create View by going to the URL – ‘/Home/Edit’. You will clearly see the Quantity is selected as ‘150’ in the Select control. 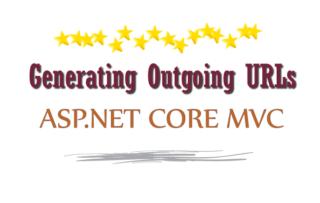 This shows the intelligence of the Core MVC framework. The asp-items Tag Helper is used to specify the source of values for the option elements contained inside the Select Element. This helps to generate the option elements from the data in some data source. The ViewBag.Quantity property is set to a SelectList object that is populated with the unique values for the Quantity property in the repository. The SelectList object resided inside the Microsoft.AspNetCore.Mvc.Rendering namespace. Run your application and request the ‘/Home/Create’ or ‘/Home/Edit’ URLs and you will find the option elements are created from the ViewBag.Quantity data source. Now refresh the page and you will notice the time in hours, minutes and seconds remains the same. This is because the time is cached. expires-on Specify an absolute time in datetime value at which the cache expires. expires-after Specifies the relative time in TimeSpan value at which the cache to expire. expires-sliding Sliding time is the period since the last usage. So this tag helper specifies the sliding time in TimeSpan value. the different versions of the cache contents. vary-by Specifies a key to manage different versions of cache contents. This means now the cache expires after 20 seconds time. This time the cache is cached until the year 2050. This will make the cache to expire in 20 second time from the last used time. To check it keep on reloading the page every 2 second you will see the same time. Now wait for 20 seconds and then reload, and this time you will see the new time. This is because the cache expired in 20 seconds time from the last reload time. The vary-by Tag Helper is used to specify a key to manage different versions of cache contents. This means the cache contents are made based on current action. Since we have 3 actions – ‘Index, Edit and Create’, so 3 versions of cache will be created (1 for each action method). The expire-sliding attributes set the sliding expiry time for these versions. There are many Built-In Tag Helpers for the Anchor Tag which are used to create href attribute with target URL of the anchor tag, and based on the routing system. asp-controller Specifies the controller the URL will target. asp-action Specifies the action the URL will target. asp-area Specifies the area the URL will target. as-route Specifies the route name the URL will target. asp-route-* Specifies the additional value for the URL to target. Example asp-route-id=”10″ provide the value 10 to the id segment of the route. 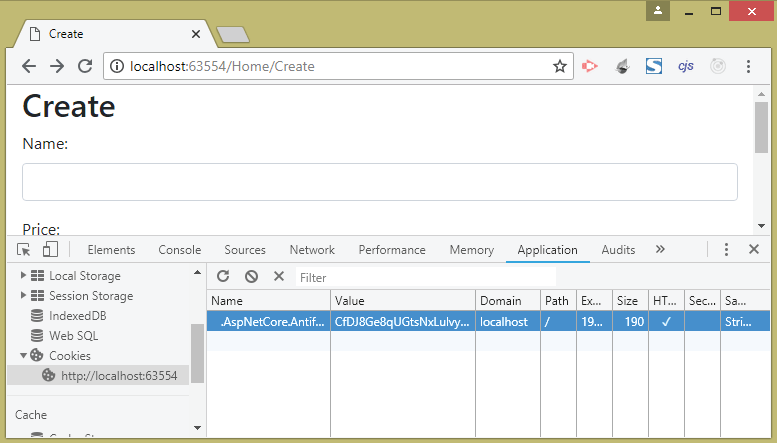 I did not provide the asp-controller tag helper because the Create View is in the same Controller the URL targets. file path whenever the contents of the file changes. with the Content Delivery Network. from the Content Delivery Network. You can also use set of wildcards to create pattern for matching files. These patterns can be used with asp-src-include, asp-src-exclude, asp-fallback-src-include and asp-fallback-src-exclude. 1. The files are removed. 2. The file names are changed. Let us include a ‘bootstrap.js’ file in the _Layout.cshtml. The location of the file is wwwroot/lib/bootstrap/dist/js/bootstrap.js. The ‘asp-src-include’ Tag helper generates the script tag for files that matches the pattern. The asp-src-exclude tag helper is used to exclude files from the View. So how to cope up with this problem? There has to be some way to tell the browser to download the file from the server when you do changes to the file. Addressing this problem is called Cache Busting. Content Delivery Networks (CDN) contains a number of Data Servers distributed around the globe. All of these Data Servers have a saved copy of a website’s static files like images, CSS, JS. When a user opens the website in the browser then rather than requesting the static files from the website’s servers, it request from the Data Server that is closest to the geographic location of the user. This reduces the load time of the website and also the bandwidth. I advise you to use CDN even if your website is small. The ‘asp-fallback-src-include’, ‘asp-fallback-src-exclude’ and ‘asp-fallback-test’ Tag Helpers are made specifically to work with CDN. Suppose in case of some problem the CDN fails to provide the load of jQuery in such a case you should load the jQuery from your website server. 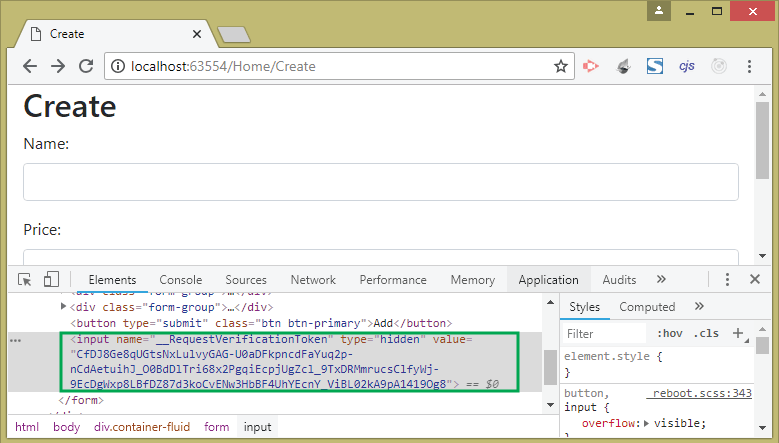 The src attribute of the script tag specifies the ASPNET CDN location to load jQuery. The asp-fallback-src-include and asp-fallback-src-exclude Tag Helpers are used to select and exclude local jQuery files in case of CDN failure. asp-href-include Specifies the CSS files to be included in the View. asp-fallback-href-test-class Specifies a CSS class that will be used to test the Content Delivery Network. asp-fallback-href-test-property Specifies a CSS class property that will be used to test the Content Delivery Network. test the Content Delivery Network. I have used the patters (** and *) for matching the files. ** – for any number of characters including charcter ‘/’. * – for any number of characters excluding charcter ‘/’. This will add the files that end whose name end with ‘.css’. So the following 3 files are added. The asp-href-exclude Tag Helper is used to exclude CSS files from View. Now use this tag helper to remove the ‘reboot’ and ‘grid’ CSS files. You can also include CSS files from Content Delivery Networks using Tag Helper. Let me show you how to add ‘bootstrap.min.css’ file from MaxCDN. The href attribute specifies the CDN URL which in my case is the MaxCDN URL for bootstrap.min.cs file. The asp-fallback-href-include and asp-fallback-href-exclude Tag Helpers are used to select the files from the website directory if the CDN is unavailable. They work by adding a meta element to the document that has been added to the class defined by the ‘asp-fallback-test-class’ tag helper. Now the ‘asp-fallback-test-property’ tag helper is used to specify a CSS property that is set by this CSS class (here ‘btn’), and the ‘asp-fallback-test-value’ tag helper is used to specify the value that it will be set to. In this tutorial I have covered most of the part of Tag Helpers. In the next tutorial I will teach you how to make Custom Tag Helpers.